After a busy summer, and a short blogging vacation last month, I am finally back to #SundaySupper for this weeks Slow-Cooker event hosted by Christie of A Kitchen Hoor’s Adventures and Heather of Hezzi-D’s Books and Cooks. The recipes being shared this week range from soups to desserts and everything in between, including a few I never would think to make in the slow-cooker! I’ve been receiving a lot of squash from my CSA in the past few weeks, and some of it I had never cooked before, like acorn squash. I was determined to use something from my CSA loot for today’s recipe, seeing as how I’ve been really bad about using all that produce (I know, horrible!) and can’t even find time to freeze it, or I remember it at midnight and really don’t feel like it. This Acorn Squash and Apple Soup uses two medium-sized acorn squash and sweet Gala apples, with a little sweet onion for extra zing. and stirred in just a little bit of pepper. Set the slow-cooker to HIGH and let the soup simmer for about 5 hours. Then I pureed it with my new immersion blender (my old one broke a few weeks ago, if you remember my mentioning my pure sadness over it), stirred in a half cup of milk and was ready to serve. This soup is creamy, slightly sweet and peppery, and reminds me of the Pumpkin Soup I make every Thanksgiving, only sweeter. Don’t get me wrong, it’s not overly sweet, just the perfect balance! I hope you enjoy this soup as much as we did, and find many other great recipes after this one at the bottom of this post. 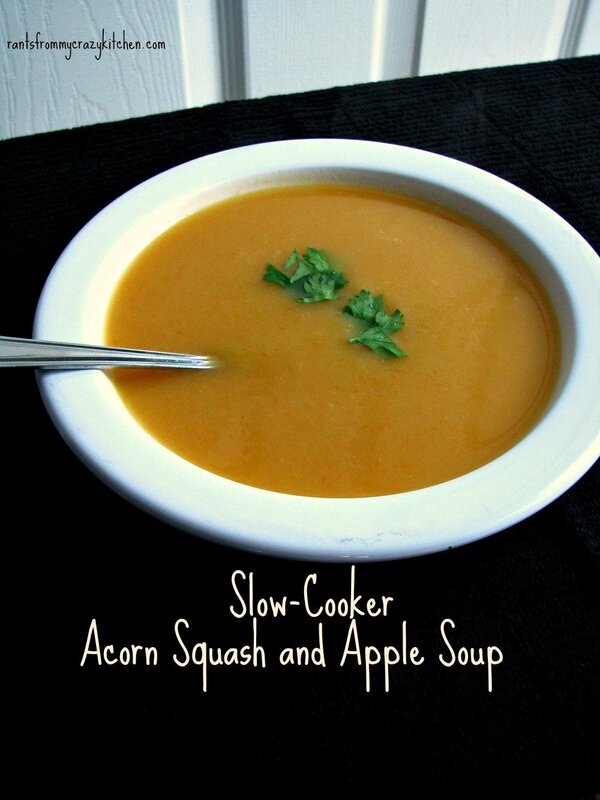 Savory acorn squash and sweet apples blended together with a creamy finish, made completely in the slow-cooker. Using a very sharp knife, make a large slit in the tops of both acorn squashes. Place in the microwave on high for 3 minutes, turning after a minute and a half. Alternate: Place in boiling water for 2 minutes. Carefully remove. Cut the squash in half, scoop out the seeds and pulp, and then cut into wedges about 1-inch thick. Cut off the skins, getting as close to the skin as you can. Once the skins and any remaining pulp are removed, cut the squash into cubes between 1-2 inches thick. 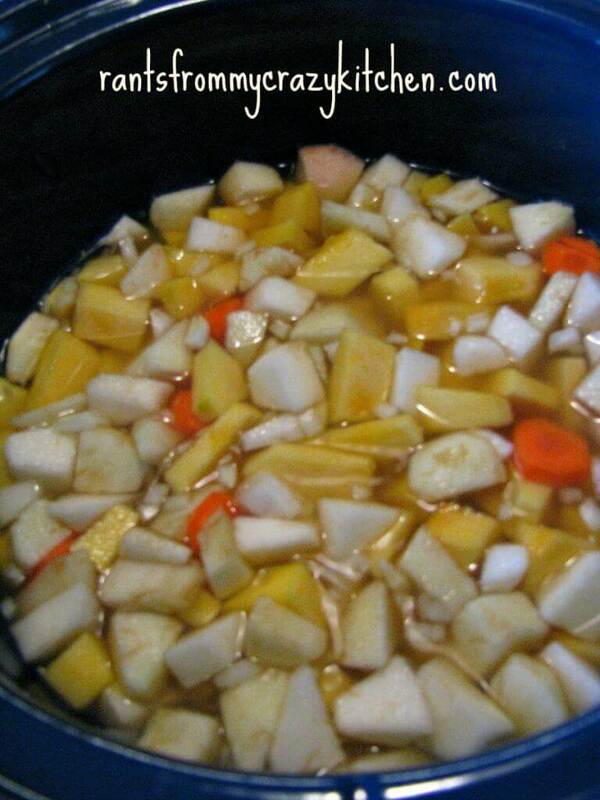 Place the cubed squash, chopped apples, carrot, onion, and garlic into the slow cooker, pour in chicken broth or water, then stir in the white pepper. Set the slow cooker on HIGH and cook for 4-6 hours, or on LOW for 8 hours, until squash is completely tender. Using an immersion blender, puree until smooth. Stir in milk, ladle into bowls and garnish with parsley. 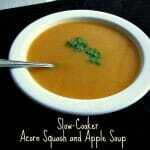 i love squash soup yours sound delicious with apples in there! Followed recipe exactly and soup was extremely bland. Thanks for sharing this recipe, but there are much better squash soup recipes out there. Hi Brian, I’m sorry you didn’t like it. Did you use chicken broth? I’m wondering if it might have to do with the brand/type of broth you used.